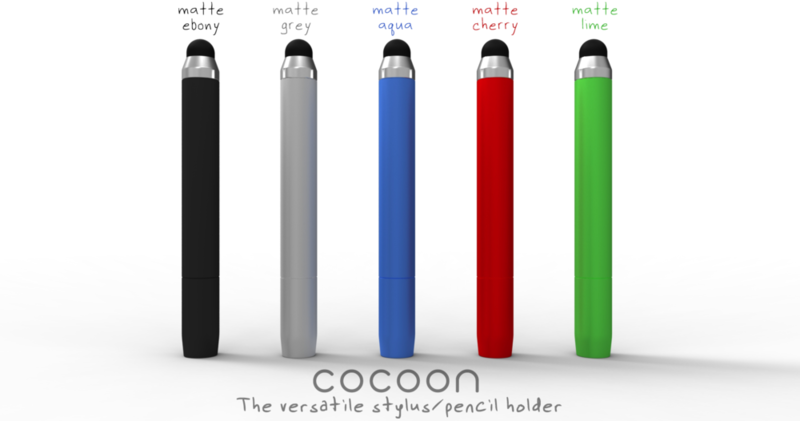 The cocoon is a versatile pencil holder with a stylus tip at the end. It is long enough to act as a stand alone stylus, but it is also a pencil holder/extender that fits most pencils or even some pens. Being an artist, I find myself sketching ideas down on paper one minute using my pencil then going right to my iPad the next. Sometimes I wish I had a stylus right next to me to sketch on the iPad as well. The cocoon will solve this problem by giving the user a pencil or pen on one end and a stylus on the other, all you have to do is flip. The stylus nip is replaceable in case it wears out or gets damaged. There can be a replaceable eraser tip as well, so that it will act exactly like a traditional pencil holder if you need it to be. Through my research, I haven't seen a detachable stylus that also acts as a pencil holder/ extender. I think it will be a useful product for many of us.